This compost tea research study shows how worm compost tea has the ability to aid in the bio-accumulation of toxins; in this case, hydrocarbon waste. Source: Vermigrand, a commercial Austrian vermiculture operation Lesinsky, D. & Veverka, M.
Aerated (worm) compost tea or ACT enhances beneficial micro-organisms and suppress pathogenic ones. The main objective of this compost research was to find out what the effect this would have on the ecological toxicity of hydrocarbon-contaminated soil. The main assumption was that micro-organisms in the aerated worm compost would speed up the remediation process. Aerated worm compost tea was produced in an extraction vessel. The test was performed on soil that was intensively contaminated by hydrocarbons from a landfill of liquid industrial waste. 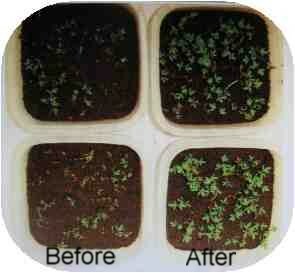 Plant growth 12 months after hydrocarbon clean-up.